Iain Stirling is joined by child team captains Leon and Eve and special guests Saima Chowdhury, Rachel Stringer, Tom Craine and Ray Bradshaw. Browse content similar to Leon v Eve. Check below for episodes and series from the same categories and more! soup for lunch, so that may change. On my right, a boy who recently did a biology project on hedgehogs. I'd tell you what grade he got, but it's a prickly subject. -the book he threw away. It's Tom Craine. a fashion vlogger who's going to teach us all how to dress. Yeah, right. Like we need teaching how to dress! known for her killer moves. And if she can stop dancing, she might even play some chess. who's said that since meeting me, she's been all starry-eyed. Although a drone did hit her on the head, so that might explain it. I'd love to go to one of his concerts, but I can't be bothered. So, what's the show all about? I've never worked it out either. to win my amazing golden stars. Along the way, I'll award bonus stars for pretty much anything. on top of each other gets himself a bonus gold star. There you go, Leon, you've got yourself a bonus gold star. and those stars are going to say bye-bye. Best avoided. It's Mr Smash. well, today is the launch of brand Smash. And the first product he's bringing to the market are one of these. It's a Mr Smash stress ball. -What do you guys think of that? Good, isn't it? Smash, have you tried one of these yet? They're great. I just feel the stress drifting away. He needs to chill out. And let's get on with the show! with the game we like to call Watch Your Mouth. It is a Mr Smash Growl Maker. Mr Smash, have you got your growl maker in? You've eaten your Growl Maker? get them in your mush. You've put it on upside down! over a steel frame using coil springs? No, no, no, just Rachel on her own. can you name three moves you could do on a trampoline? Say that right down camera one. You're like Wallace in Wallace and Gromit, he was like Lord Voldemort. OK. Next one, fingers on buzzers. I think they are types of wizards. Do it right down that camera. colours and is commonly worn on the lip? For a bonus point, can you apply some lipstick? Who on the team is going to take it on? You don't have to do it, but it is for a point. -I'll do it if you want. Now, with the lipstick on, look down camera one and just go Harry Potter. -No, over to Eve's team. Is it a guinea pig? A guinea pig is correct! Now it's what your telly was made for, it's time for Pie The Supply. We're about to meet four humans, or are they? All claiming to be art teachers, or are they? and actually they are all human, probably. and if both teams fail, then there will be consequences! OK. We have got Ms Lyon. Mr Callan. And Ms Benzie. Leon's team, looking at them, who looks arty, which one? Yeah, she looks friendly, art teachers are usually friendly. -Who do you think, Leon? You think number one as well? OK, we'll go over to Eve's team. -Go on, Eve, what do you think? -I think two or maybe four. I could kind of, like, see him, with like a palette, like. Who, number two? What kind of paintings? -"I look at number two and I think landscapes." Right. Well, let's find out. We can ask them all questions. We'll go back over to Leon's team. Have you got any questions you'd like to ask? Art teachers. Any questions you want to ask them? I'm going to put it out there. I'll ask you a question. Who's your favourite artist and why? Definitely not an art teacher! Number three, your favourite artist, and why. Um, I would say Vincent van Gogh. What's your favourite Vincent van Gogh painting? That's great, you admire his work. -That's a tough one. What's your favourite? Leon's team, any more questions? Saima, Leon, have you got any questions you want to ask them? Um, let's start with number one. rather than very fine drawing. Three's my favourite, whatever happens. can you do an impression of how you would paint? Let's see how natural it is. -Number two, do your impression of painting. So you've licked the paint off the brush. Number three's just got back into the race. And number four, let's see your air painting. Oh, she had a brush. which Eve thinks you'd be excellent at, um, what paints would you use? I want you to shout at me and tell me off. "Oh, the same." OK, number three. Tell off Ray for being a naughty boy. That is detention, enough of that. Out of my classroom now. -OK. Number four? How would you tell me off? Oh, she was loud, but sounded far away. -Clean it up or everyone has a time out for five minutes. -You've got ten seconds to decide. Look at the state of that! Actually, that's better than your painting. I'll tell you what, this teacher's got bantz. Audience, which do you think is the art teacher? and more threes than is absolutely necessary. Leon. It's time for you to pie the supply. Oh! Where's he going, where is he going? -Please go and pie the supply. teacher. Number one looks fearful. Number two... Number three couldn't care less. Eve, do you think... Oh, you feel bad? -It's part of the game, Eve, don't you worry. OK. Would the real supply teacher please step forward? I said, "Beware of a teacher with bantz." He's now a teacher with pie. This is the Teacher's Revenge. Number two, Mr Gallagher, please step forward. Gently place the pie into the child's face. You can leave it down there. That was the Teacher's Revenge! -Time now to tune in. song to perform using one of these bad boys. performed. Up first, Leon's team. So, Leon, who do you want? OK, Saima and Leon, please make your way to the floor. Leon and his kazoo partner, Saima Choudury. OK, Tom, your time starts when you flip over your first board. -Guys, get ready with your kazoos. Let's play. -Mary Had A Little Lamb? I'm going to skip it, I'm going to skip it! Jingle Bells. I bet you get this one. # Jingle bells, jingle bells. # Keep going. Keep going! One more, go on. Tom Craine, "Name all the songs you know." Who do you want to bring with you, Ray or Rachelle, AKA Rachel? I think I might go with Rachel. OK, Eve and Rachel, please make your way to the floor. Eve and her kazoo partner, Rachel Stringer. Ray, your time starts when you flip over your first flippy thing. -Oh, this is a great one. Yeah, what song is it? That was great. Well done. What a tune, come on. I've never watched... I've never watched this in my life. You've learnt something about me. You've never watched The Simpsons?! -My mum wouldn't let me. No, don't... Stop laughing into your kazoos. Oh, guys, have a sit down. ..gold star goes to Eve's team! I feel like some high school dropouts. The Dog Ate My Homework drop zone! two quivering guests face a barrage of general knowledge questions. full of Mr Smash's dirty laundry. There you go. Applauding a man sniffing his own pants. OK. Leon, who do you want to see on top of a bin? -I think you're going to get binned, mate. And, Eve, who do you want to get binned? on top of the drop zone! but you can confer, and the first question is for you, Tom. Oh, erm, what do you think? Does America even have rules when it comes to presidents? -I think 32 seems reasonable. -What do you think, Leon? -Erm, let's go for 32. What about if I said 35's the correct answer? you want the worst for me. You go to amber, Tom Craine. -I'll get the buttons out. What are we thinking, Eve? The word I can't say or the variable one, what do you think? The other one you can't say. Well, I think I may have heard of anemometer. -Yeah, I'll go with the first one. What if I told you that the correct answer was variometer? then I think Tom and I have learnt a valuable lesson. You've got the correct answer. It's anemometer. Well done. Let Me Take A Selfie, I think it came out in 2015. I thought that was good. Seemed to be some kind of logic there. -I'm going to go with selfie. That's what I'm going to go with. -What if I told you the correct answer is emoji? I would still stick with selfie cos I believe in my team. -You're in the danger zone, Craine! I've told you the correct answer both times. OK, Ray, you're still on the green, let's see if you can stay that way. Eve - what do you prefer, cats or dogs? Well, I'm going to say that I think it would be cats. But I do like dogs better. so it wouldn't be about a fear of dogs. I'm going to go... Fear of cats? Go. OK, let's go fear of cats. -Going with fear of cats? -You go to amber, mate. Get in the amber. It complements your lovely ginger hue. despite the fact I told you the correct answer every single time. What's down here? What's in this? Erm, what do you think? -You were around then, weren't you? Bonus gold star to Saima. if I was going to say. You don't even know, right! Leon's just given up on you. OK. So 1956, is there a song that might give us a clue? -Yeah, 1958, there we are. ..that the correct answer was 1956? -What would you do then? -that is what would happen. -You going to stick with 1958? Erm, do you have faith in me, guys? Just tell me you believe in me. So, 1958, my team don't believe in me, but I'm sticking with it. -Drop him, drop him, drop him! That means Ray's the winner and the gold star goes to Eve's team! Do I take it I will just get some ladders, yeah? Yeah, we're going to get the ladder. -Drop him! Drop him! Drop him! All I need to do now is add up the stars. friend. Good luck with that. As for Leon's team, I'm not going to say who's responsible. It's you, Tom. It's you. but you've got detention with Mr Smash. It's time to take the walk of shame. So, guys, that's your lot. As ever, we probably didn't learn much, but it was fun trying. -The Dog Ate My Homework! Two teams fight it out to dodge detention. 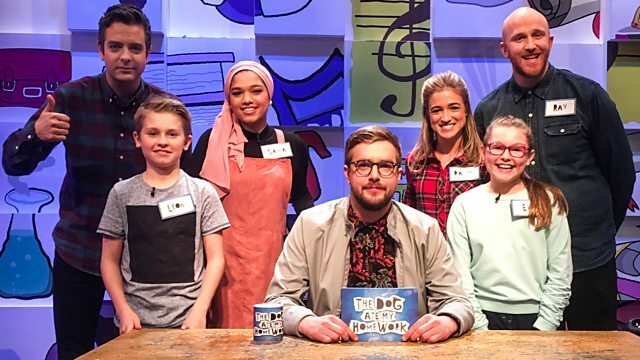 Iain Stirling is joined by child team captains Leon and Eve and special guests Saima Chowdhury, Rachel Stringer, Tom Craine and Ray Bradshaw, who battle it out in a series of hilarious rounds and challenges.